Dava's back! 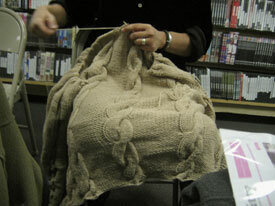 And she's working on an afghan in Rowan Cork. 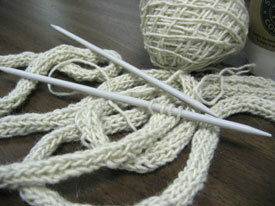 Talk about squooshy yarn! Cork is so fabulous. 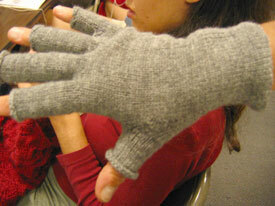 Vintage Bernat yarn + vintage glove pattern = Dava's fabulous fingerless gloves. I so want a pair of these! Dava's making mittens again! She's got a fabulous vintage pattern that she uses to make what seems like scores of mittens each year. 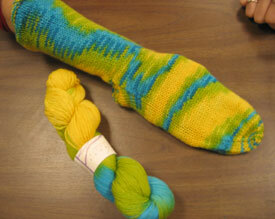 Look at the cool vintage yarn that she's using for these! 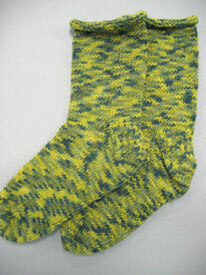 Dava finished her funky green socks. The yarn is from School Products in NYC and she finished them on her latest trip down to NYC. Way to go, Dava! 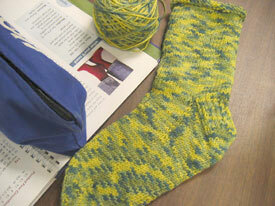 She's working on some fun socks with cool green yarn that she got at School Products in NYC. Dava's still making i-cord for her i-cord rug. Look at how much she's done so far!! 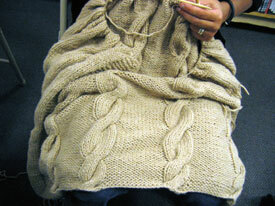 Dava doesn't just knit your typical ol' sweaters and scarves. 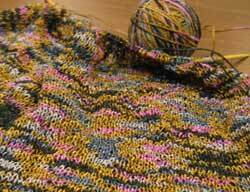 Recently, she's been working on more unusual knits. 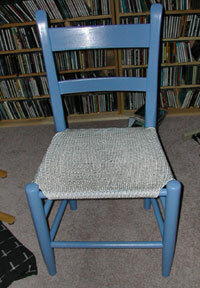 First, she made a cool chair cover. 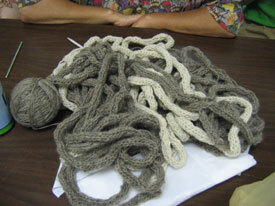 And now she's knitting yards and yards of i-cord to make a rug. 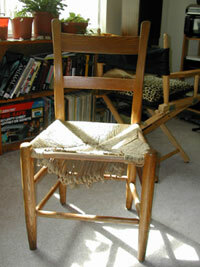 Next up the screen door from Interweave Knits, eh, Dava? Dava, this is the coolest pooling I've ever seen! Lorna's Laces Shephard Sport rules. 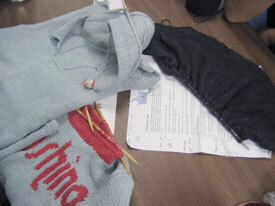 Dava's back and she's making a "nothing but a t-shirt" in a beautiful black silk. Dava got the neatest hat for Christmas! 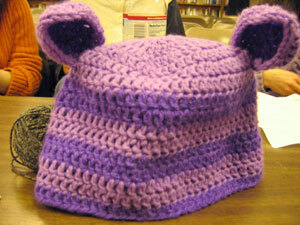 It's crocheted with little ears. So funny! 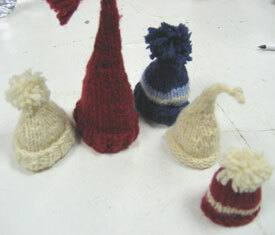 This week the Knitsmiths focused on holiday gift knitting. While I was working on mini-Weasley ornaments, Dava was working on mini-hat ornaments. 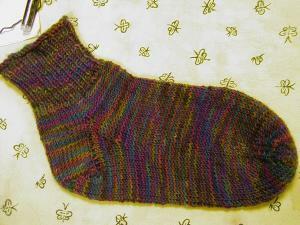 Dava's blog may be on summer break, but she's still knitting! 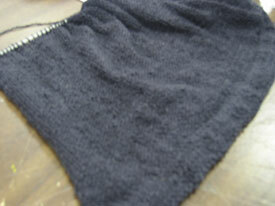 Here's a cardigan she's starting with some really neat yarn made out of bark and paper. Love those colors! We look this good everyday! 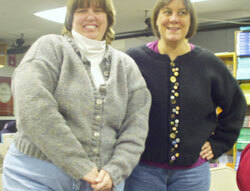 Sandy and Dava show off their incredible Everyday Cardigans. 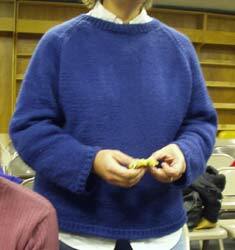 Dava knit this sweater last year. Isn't it just perfect on her? 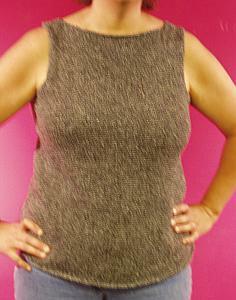 Dava liked the pattern for the Pagan tank so much, she made another, in silk! 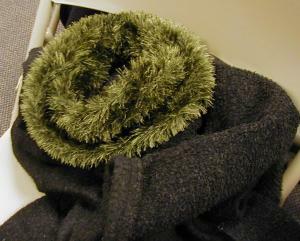 Dava's new scarf, made with a really fun chenille yarn she got on the last Knitsmiths field trip (to Sakonnet Purls in Rhode Island). 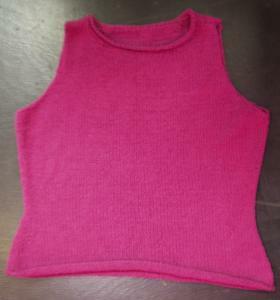 And here is Dava's Pagan tank from our tank girls knitalong. I couldn't get the color to come out at all correctly. It's really a beautiful rich purple color called Kiss. 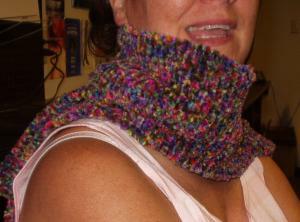 This is an awesome scarf that Dava recently made with Berrocco's Chinchilla yarn. 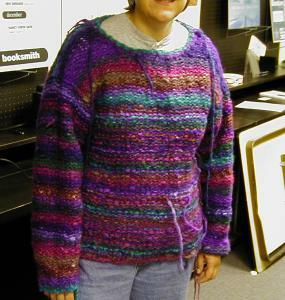 And here's a sweater she's finishing up just in time for the cold. Yeah! 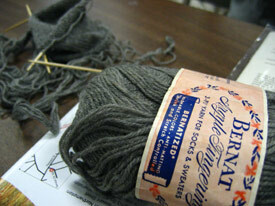 Dava, Knitsmiths' founder, is making socks with some fabulous yarn she got at the Granite State Knit-In in June. Cute!